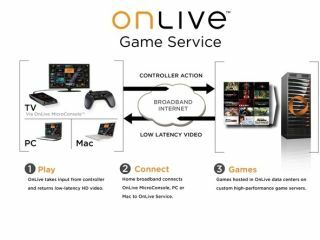 Will Google or Microsoft buy OnLive? Will Google or Microsoft look to buy OnLive's 'cloud gaming' technology? OnLive's cloud gaming technology was the talk of this years Games Developers Conference, with many games industry pundits finding it hard to believe such a server-based gaming system could work - technically or financially - in delivering high def gaming to the mass market. Guy de Beer, CEO of Playcast Media - another new 'cloud gaming' tech that streams games via your TV set-top box - has responded to a number of recent criticisms of OnLive's offering - and he believes that the company is essentially looking to sell its proprietary tech to the likes of Google or Microsoft. The original critique of OnLive's tech – which appeared in an in-depth article over on Eurogamer – in which writer Richard Leadbetter stated: "Realistically, there is no way it can work to the extent suggested, and no way it can provide a gaming experience as good as the one you already have without inherent compromises. It's a great idea, and an intriguing demo that is amazing in that it actually works at all. "However, away from the concept and the tech demos running in controlled conditions, OnLive raises so many technical questions and seemingly overcomes so many impossible challenges that it can't possibly work." "When I set out to build this thing, we looked at it and said, 'Look, in theory it's possible to do, but in practice we just didn't know if it could actually be done. "We knew people were going to be skeptical. And they should be, you know? But they would go and say, hmm, we've got nine of the top publishers behind this thing; do we really think these guys are gonna take their top titles, commit them for release the same retail window as you know, the titles when they come out for the consoles, and they're gonna let us show games on the floor here, which are actually just being released the day that the OnLive booth opens, you know? "The only reason they're going to do that is, obviously, they've gone through tons and tons of testing as well," added the OnLive boss. Richard Leadbetter's critique on Eurogamer "touches some of the important elements which streaming video games involves," agrees Guy de Beer, CEO of set-top box streaming service Playcast Media. The Playcast boss explains that his service "runs a high density of high end games on the server side, including all the required game and video processing," adding that "while there are a long list of technological barriers of achieving such densities, it certainly does not fall into the "impossible" category. "I can not disclose the know-how related to the solution of this challenge, but in our system, the actual hardware cost is negligible. I can only assume that OnLive has achieved similar solutions." The nub of Leadbetters' critique of OnLive was the video encoding conundrum. "Leadbetter is mistaken with regards to two assumptions - one - that game video should be treated as "natural" video, and - two - that OnLive is streaming standard MPEG video," argues de Beer. "Games have some very significant characters that allow a much faster compression process, which is not possible on "natural" video. OnLive is not streaming standard MPEG video - they require their own decoder. In this proprietary system, they can control the video decoding process, and "help" the encoding process in ways which are impossible with standard video decoders. The key figure to look out for here "is the end-to-end latency which depends on average on the performance of 30 different systems (routers, firewalls, servers, optics) and 10 different protocols," says de Beer, adding that, "since the internet is a "non-guaranteed quality of service" network, no one can really predict what the real performance would be.